factory farming » POP! goes The Vegan. 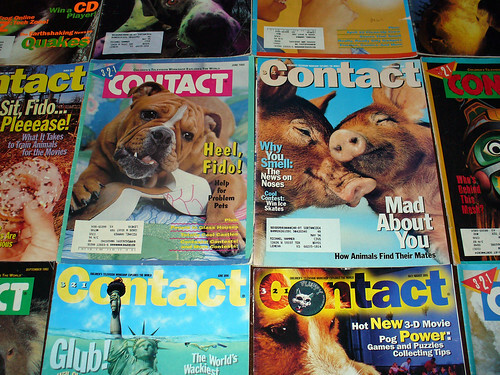 A pile of 3-2-1 Contact magazines that I found in my filled-to-overflowing library. Have a problem, who me? In Prisoned Chickens, Poisoned Eggs: An inside look at the modern poultry industry (1996; revised 2009) animal advocate Karen Davis offers an exhaustive and heart-wrenching examination of the “poultry” industry, which is responsible for the exploitation and slaughter of an astounding 10 billion chickens annually (in the U.S. alone; worldwide, 40 billion chickens are raised and killed for their meat and eggs ever year). During her journey from the wild to the farm – and from conception to death – Davis touches upon some of the social and psychological mechanisms that pave the way for these atrocities. Humans are taught from an early age that the earth’s resources – including other sentient beings – were “put here for our use.” We create a false divide between “us” and “them” by denying our own animal nature: there are “humans” and there are “animals.” We deny our similarities – the ability to feel pain, experience emotions such as love and joy (and sadness and fear), form and nurture fulfilling relationships – while simultaneously looking to our relatively minor but wonderfully diverse differences as an excuse to objectify, enslave and exploit the “other.” Nonhuman animals are largely considered property – “its” – more akin to a tree or tomato plant than a human being. Simply put, we exist in a supremely speciesist and anthropocentric culture – and we indoctrinate each successive generation into accepting this skewed and oppressive worldview. [A full discussion of Prisoned Chickens, Poisoned Eggs is well beyond the scope of this blog, but you can read a rather lengthy review I published on V for Vegan. If the psychology of animal exploitation is a topic that piques your interest, check out Melanie Joy’s Why We Love Dogs, Eat Pigs, and Wear Cows: An Introduction to Carnism (2009), which I reviewed here. This entry was posted on Saturday, January 1st, 2011 at 12:49 pm and is filed under Television. You can follow any responses to this entry through the RSS 2.0 feed. You can leave a response, or trackback from your own site. Add your voice to Biz Markie’s Earth Day remix of “Just a Friend”! What do Earth Day, YouTube’s home page and a rap classic have in common? On April 22, we’ll be releasing a remix of the top-ten-hit song “Just a Friend” performed by Biz Markie and Repower America supporters from across the country. It’s going to be featured all day on YouTube’s home page — and you can be part of the fun! You don’t need a perfect singing voice to get involved — and for that matter, you don’t even need to know the song. In fact, the chorus to Biz Markie’s song is famous for being beautifully off-key. If you’re still not convinced that you’re ready to bust out rapping on tape, just lip-sync or dance in your video. (Or get your kids to.) The only thing that matters is that you participate — in whatever way works for you. We’ve got everything else you need to sing along — lyrics, music and a video showing you how to record your own version. Naturally, the “eco-friendly” lyrics ignore the role of meat, egg and dairy production in climate change – which is well in keeping with environmental organizations’ unwillingness to address human privilege and its many attendant ills. That said, perhaps some of you more creative types can work a reference or two to veganism into your own video? If you’re interested, you have to move fast – the deadline for submissions is midnight tomorrow night, April 18th. Eastern time, I presume? After a young woman is sexually assaulted and murdered, Detectives Olivia Benson (Mariska Hargitay) and Eliot Stabler (Chris Meloni) track down the woman’s boyfriend – their first suspect – but learn that he is a devout vegan who wouldn’t hurt a fly. They soon find that the victim had been deeply involved in the fight to expose questionable practices in the meat-packing industry, even going undercover at a large company to find out the truth. Benson goes undercover herself to retrace the woman’s footsteps and to identify who the victim might have angered along the way. “Beef” will air this Wednesday, April 21, on NBC at 10PM EDT. This entry was posted on Saturday, April 17th, 2010 at 11:36 am and is filed under Coming Soon, Link Love. You can follow any responses to this entry through the RSS 2.0 feed. You can leave a response, or trackback from your own site. Join United Poultry Concerns & Mercy For Animals at the Columbus Library! United Poultry Concerns and Mercy For Animals invite you to attend a screening of MFA’s award winning film Fowl Play and a presentation by UPC president Karen Davis in honor of International Respect for Chickens Month/May. Hosted by the Columbus Library on Saturday, May 15 from 11:30am to 2:00pm – the day preceding the Third Annual Veggie Pride Parade in NYC – this event will be followed by leafleting for chickens! This entry was posted on Sunday, March 28th, 2010 at 5:25 pm and is filed under Coming Soon, Film. You can follow any responses to this entry through the RSS 2.0 feed. You can leave a response, or trackback from your own site. This Thursday, March 18 and Friday, March 19, tune into Planet Green to watch Coal Country – then enter to win a copy of Plundering Appalachia from Earthjustice! Contest rules and details here. Thursday, April 22 marks the 40th anniversary of Earth Day. In honor of the occasion, the No Impact Project is helping citizens host screenings of No Impact Man throughout the country (world?). It’s the 40th anniversary of Earth Day. Let’s do something about it! Turn off your TV. Stop shopping. Eat a carrot. Get on a bike. Put a moratorium on litter. And join our friends the No Impact Project, Slow Food USA and 1Sky for an action-oriented screening of No Impact Man. During the week of Earth Day 2010, you are invited to bring your community together to watch, discuss and act. The theme of this event is the impact of food production on climate change and what your community can do to take action. Check out the No Impact Man trailer and contact Lindsay to learn how you can become a host. To find a screening in your neighborhood, click here. Your mission, should you choose to accept it, is to attend (or host!) a local screening, boxes of vegan baked goods and vegan starter kits in tow! Saturday, April 24, Vancouver-based animal advocacy group Liberation BC will be screening Meat the Truth; doors open at 3:30 PM. For additional details, see their latest newsletter or events page – or shoot ’em an email at info [at] liberationbc.org. Did I miss something? Promote your local event, tell us all about your favorite new release, and share other animal-friendly pop culture goodies in the comments! This entry was posted on Sunday, March 14th, 2010 at 8:27 pm and is filed under Link Love. You can follow any responses to this entry through the RSS 2.0 feed. You can leave a response, or trackback from your own site. The horrors of modern fetus farms. The (d)evolution of animal agriculture sounds so much more insidious (and comical, natch!) when applied to human vs. non-human animals! If only they could grow in vitro embryos. Oh, wait. John Oliver does his best Bush impression to prove science is undermining America. This entry was posted on Wednesday, March 18th, 2009 at 5:12 pm and is filed under Television. You can follow any responses to this entry through the RSS 2.0 feed. You can leave a response, or trackback from your own site. Paul McCartney & The Chicken Council duke it out on The Colbert Report! OK, well, not really. Paul McCartney appeared on Wednesday’s episode, the same episode wherein Stephen “broke” the “buffalo wing” shortage crisis story. But Stephen didn’t interview the obligatory white dude from the National Chicken Council until the next night, so he and McCartney never met. I doubt McCartney was even privy to the Superbowl/”buffalo wing” story, since his interview was pre-recorded. Still, catchy title, dontchathink? Now for the “buffalo wing” shortage, which spanned two segments. The Richard Lobb interview is by far the more interesting of the two clips, so if you watch only one video, make it the second one below. This entry was posted on Sunday, February 1st, 2009 at 5:56 pm and is filed under Television. You can follow any responses to this entry through the RSS 2.0 feed. You can leave a response, or trackback from your own site. Appropriately, “Food Rights” is Threat #2, about three minutes in. This entry was posted on Saturday, November 8th, 2008 at 7:47 pm and is filed under Television. You can follow any responses to this entry through the RSS 2.0 feed. You can leave a response, or trackback from your own site.